My husband hired his kilt and his four ushers kilts from here for our wedding. The staff were so helpful and the kilts were of the best quality and they all looked so handsome in them. 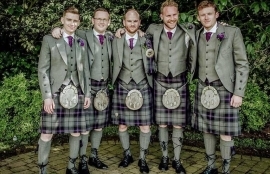 I would highly recommend slanj kilts for anyone looking for kilts for their wedding. Slanj Originals (right next door to original Slanj - yes it is slightly confusing) is more orientated than it's big brother. They focus on Scottish themed clothes like Batman t-shirts, but instead of the original Batman logo, it's a bat made out of thistles, and there's a similar superman-esq one too. Or, as I bought my American friend, an "I (HEART) Boys in Kilts" T-shirt. And, for the men, 'Bawbags' boxers. Classic. The shop assistants are brilliant and helpful - only too happy to help you find something that you need, or want (sizes, colours, etc). Maybe slightly too expensive to be a novelty shop, but if you need anything Scotland themed (that isn't a 'See You Jimmy' hat, or 100% tartan), I'd go here.